No, Grand Theft Auto VI Isn't Releasing Next Year. Rockstar Games is known for the unconventional nature when it comes to publicity. In an era where game trailers and trade show appearances have become the norm, the secretive developers rarely release screenshots and haven't attended E3 in over a decade. Living up to their name, they don't follow the rules. And perhaps it's that audacious reputation that lead some to fall for this recent scam. 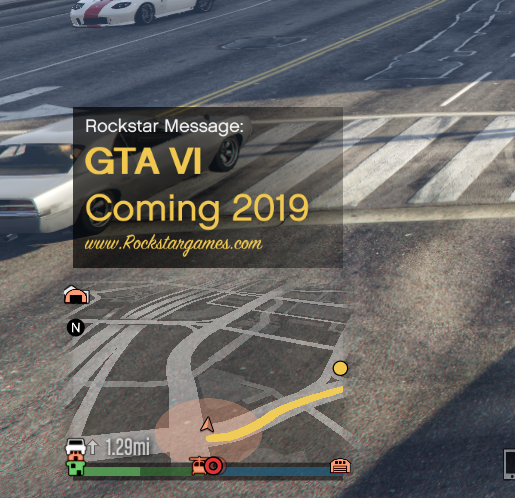 Earlier in the week, Grand Theft Auto Online players began reporting a strange series of in-game notifications reading "GTA IV Coming 2019" The messages were designed to look similar to an official Rockstar Games statement, even linking to their website. Players of the PC, PlayStation 3, and Xbox 360 version reported receiving the notification multiple times. Rockstar Support was quick to dismiss the elaborate prank on Twitter, stating "This is a hoax made with the use of mods, and not an official message or statement from Rockstar Games." If that wasn't enough proof, players on the more secure PlayStation 4 and Xbox One versions of the game were not sent the same message. Though the exact cause remains unknown, some users assume this may be the result of a Rockstar Social Club exploit, the multiplayer platform used for Grand Theft Auto V.
In actual Rockstar news, Red Dead Redemption 2 will launch on the PlayStation 4 and Xbox One on October 26.